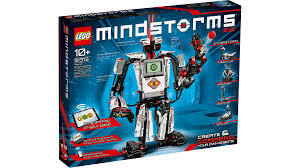 The LEGO MINDSTORMS EV3 kit is LEGO's newest member of the MINDSTORMS series. It uses the same LEGO Technic building parts as LEGO MINDSTORMS NXT, however, the design of the attachment points on the motors, sensors and intelligent brick are different. Also, the inventory of building parts in the kit and the programming software are different. This means that you cannot directly use building instructions or programs designed for NXT with an EV3 kit. However, you may be inspired by these designs for NXT 1.0 and NXT 2.0 and challenge yourself to adapt them for your EV3 kit. For projects specifically designed for the EV3 kit, you can see the links below to other sites that have provided building instructions and/or programs. Copyright © 2007-2016 by Dave Parker. All rights reserved. nxtprograms.com is neither affiliated with nor endorsed by the LEGO Group.